Although certainly not as bitter as other post-war films, this is a rather downbeat drama -- at least in the version that appears to have survived, for I've read suggestions that director Henri Decoin shot two endings, one rather more optimistic in tone to the one on view here. 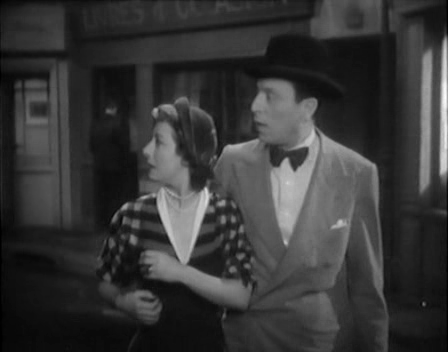 As Farran Smith Nehme wrote recently, love stories that begin mid-marriage are rare cinematic animals, and this film opens with a lovely sequence in which Louis Jouvet and Renée Devillers, married for many years, re-enact their first meeting in a country banquet hall. 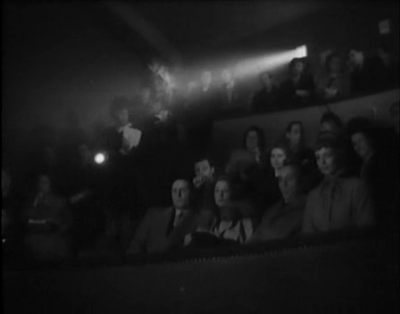 The script, by Henri Jeanson, has the couple playfully spar with one another, underlining their vast reserves of affection, while Jeanson also enjoys himself by assigning Jouvet a terrific monologue about going to the movies and suspecting that certain outcomes are possible or impossible simply because of the presence of the stars. The idea of game playing between couples crops up again throughout the film, though not always with the same benign and pleasurable results; the central narrative deals with suspicions of infidelity even in such an apparently grounded marriage. Henri Decoin was a prolific director, though I've only seen two or three of his films; his work here is solid, and occasionally, as in the handling of the film's various monologues, something more (the montage in which Jouvet and Devillers narrate the history of their relationship in voiceover is especially good). There's an uncertainty in the tone, though, that's disconcerting at times -- the film slips from a kind of pastoral poetry in two forest sequences to an unexpected breath of realism in a scene where Dany Robin (as Monelle, the young woman who appears to distract Jouvet from his marriage) steps off a bus clearly filmed in the streets of Paris -- nouvelle vague shooting avant la lettre, and not sustained, for in the next shot Robin is clearly back on the studio sound stage.